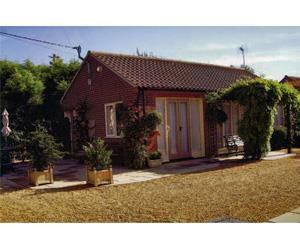 Rushmeadow studio is very well appointed and is set well back from the road with ample parking. The accommodation consists of a large bedroom with double bed and bunks, lounge/diner with TV/video, DVD and radio, and a fully fitted kitchen with double oven, fridge, freezer and microwave. Patio area. Electric/gas cooking, gas/electric fires, fridge, electric shaver points, secure cycle storage. Children welcome from any age. On A149 Hunstanton to Wells road on edge of Thornham village. From King's Lynn to Hunstanton, rail link bus from station to Hunstanton. Coastliner bus to Thornham from Hunstanton bus station.